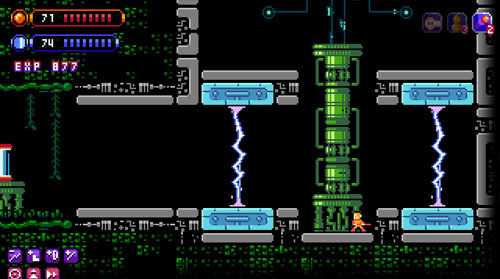 A game by Bitca Games for PC, Mac, and Android, originally released in 2019. Sun Wukong vs Robot (a.k.a. 孙悟空大战机器金刚) is an open world action-platformer starring Sun Wukong and set in a sci-fi world of robots. Sun Wukong is the Monkey King of Chinese legend and is known from the classic novel Journey to the West, and he has featured in numerous tales since that time, as well as adaptations into modern media. The legendary Monkey King is known to carry a heavy rod that he uses to fight his enemies, along with an incredible cloud jump that allows him to reach great heights, and the ability to pluck his hairs to turn them into weapons or copies of himself. 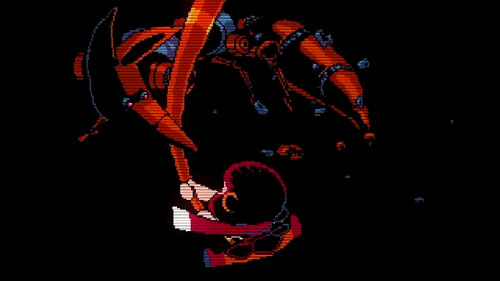 The game begins with a smooth and stylish scanline-laden cinematic introducing Wukong as he does battle with four robots, which acts as a preview for the action ahead. Here, Wukong smashes robots with his staff, blasts them with lasers from his eyes, makes copies of himself that somersault into the air, and spews green smoke from a magic gourd. 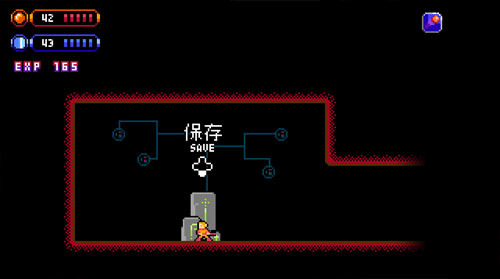 Ultimately, he is defeated by the robots and imprisoned in a glass capsule where he remains for 500 years… referring to the 500 years that the legendary hero spent imprisoned under a mountain in Journey to the West. When he does awaken, standing next to a smashed stasis capsule, Wukong discovers that a “mind locker” has been placed upon his head, limiting his abilities with the power of four gems. But he still has his rod, which he must use to battle his way through the world and ultimately destroy the four robots, each of which corresponds to one of the gems. Only then can he be free. Wukong has a 3x variable jump and the ability to perform an overhead swipe with his staff. He can also swipe in midair, but doing so causes him to smash downward more quickly. Throughout his journey, he gains access to numerous abilities that allow him to perform magic, navigate the environment to reach new areas, and increase his effectiveness in battle. 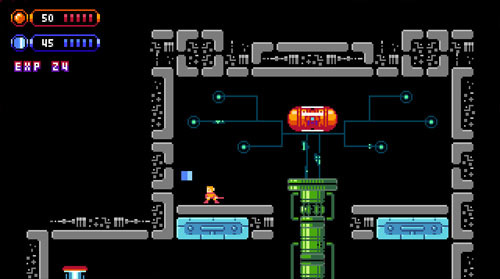 The game has some light metroidvania elements, as certain areas are blocked off until new abilities are gained. While some abilities are unlocked by defeating bosses, the player is also free to purchase these same upgrades at any time and thus tackle the world as he likes. 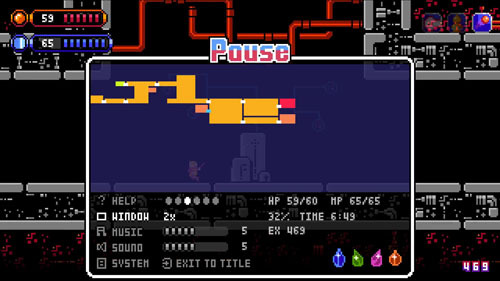 As the player defeats enemies, he gains experience points, and enemies respawn when leaving a room and reentering, allowing players to farm XP to make purchases if they choose. Unlockable abilities include a cloud jump, which allows Wukong to perform two additional jumps in midair, reaching almost any point in the environment. Another is a dash maneuver that allows him to dash quickly on the ground or in the air to sidestep enemies and cross gaps. And there is a shield that allows him to deflect projectiles for a few seconds, although this ability must be charged before it can be used, and it is ineffective against melee strikes. Some other abilities may only be purchased, and these include increased attack power, increased defense, and the ability to pass through electrical barriers or lava without taking damage. The first two of these upgrades make Wukong more effective in combat, allowing him to reach deeper layers of the underground structure and face tougher enemies and bosses. The second two upgrades are used to gate access to certain areas and magical items. 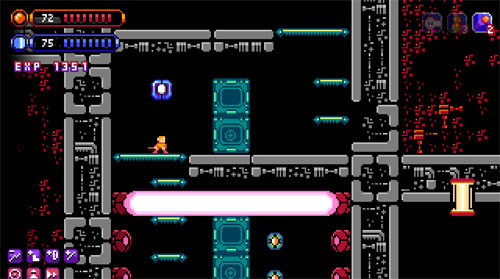 That said, players are free to pass through laser barriers and walk through lava, but they will sustain heavy damage unless these upgrades have been unlocked. Finally, there are three magical spells, which may only be found by thoroughly exploring the environment. These include the “eye ray”, which lets Wukong blast a laser beam out of his eyes to do damage in a straight line to the left or right, passing through walls and potentially striking multiple enemies simultaneously for continuous damage as long as the beam is active. 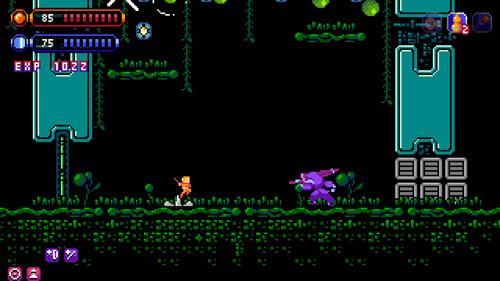 Another ability is “monkey rush”, which lets Wukong create a clone of himself that he lobs through the air in an arc to do light damage against most enemies (some are impervious). Then there’s the “hulu flame” which is a gourd that floats near Wukong and emits a steady stream of green smoke, doing light continuous damage to anything it touches, and the player can rotate the gourd clockwise or counterclockwise by pressing UP or DOWN. Each of these magic abilities drains from an MP meter that can be refilled by grabbing pickups in the environment. The somersaulting monkeys only use 1MP each, whereas the laser beam and gourd use 5MP each, although the laser beam can be fired continuously, draining the meter much more quickly but doing big damage over time. Players who thoroughly explore the environment can find multiples of each of these magic items, allowing them to eventually triple their firepower without an increase in MP cost. In addition, exploration also leads to canisters that provide permanent MP and HP increases in increments of 5 or 10 units. 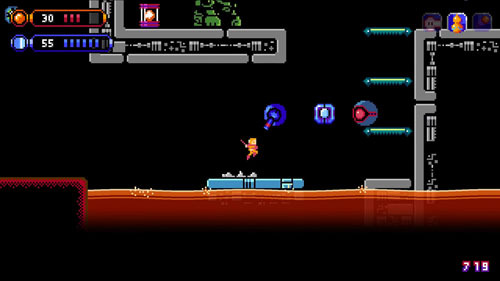 The player is generally free to tackle the world as he likes, and it’s certainly possible to complete the game without acquiring most of the upgrades. However, there are numerous situations that are specifically designed around using these abilities. For instance, there are areas that are lined on both sides with turrets, allowing you to pass through safely by activating the shield. 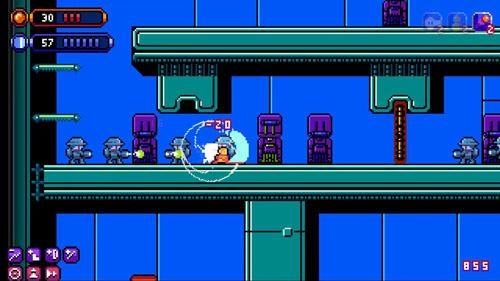 Other areas feature rows of projectile-firing enemies on the far side of closed doors, allowing you to blast them all at once with your eye lasers. There is a decent variety of enemies that require differing strategies to defeat. These include simple drones that die in one hit but are dispensed continuously by spawners until said spawners are destroyed. Humanoid robots patrol back and forth, but hitting them will cause them to almost instantly fire back at you, so you need to sneak up from behind or strike and jump away quickly since they take two hits to destroy. Gorilla-like bots take a ton of damage, and they can hurt you badly with their heavy strikes, but they attack slowly and are incapable of movement. Turrets spin and aim toward you, but they spin slowly and most are destroyed in a single hit. Kamikaze bots dash toward you quickly and explode, but you can also lure them to harm other enemies. There are also occasions where gorillas or kamikazes may be found riding on hovering platforms with turrets on either side, and you can jump on the platforms to fight the enemies, strike the turrets, or bring the whole platform crashing down in a fiery heap. There are some pesky shuriken-tossing bats that are tough to hit, with attacks that are tough to dodge, and they take a ton of hits to destroy, and sometimes you have to deal with more than one at a time, meaning they’re best to deal with after you have acquired the attack and defense upgrades… or you can just run for your life. 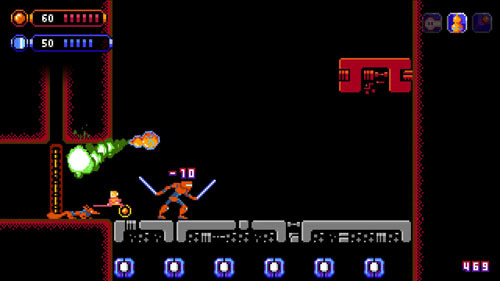 That said, there’s plenty of room for players to employ smart techniques to take down tough foes, such as luring them away from other enemies, using doorways to block enemy progress, or just simple hit-and-run tactics. 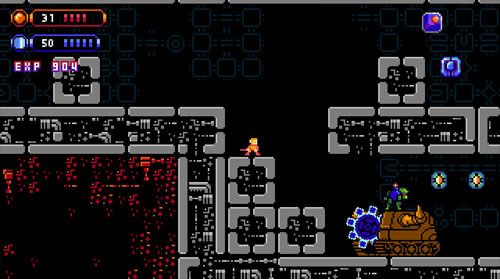 The game features a few save rooms spread throughout the underground structure, and these fully restore health and magic. Getting killed returns the player to his most recent save point with all progress lost, including any upgrades, HP or MP increases, and map progress. 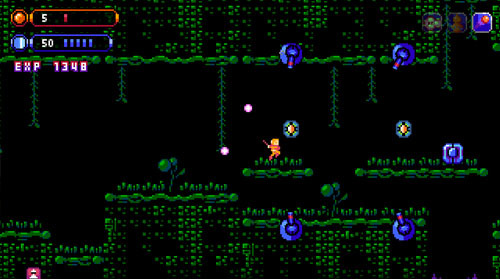 As such, there are some tense moments as the player makes significant progress and then must decide wither to press forward in hopes of finding another save point, or returning to previously-explored territory and play it safe… while also fighting respawned enemies in those areas. 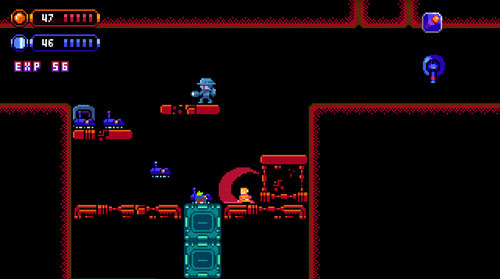 A metroidvania map tracks the player’s progress through the world and helps him determine where he has yet to explore, making it somewhat easier to track down upgrades and the four boss robots, and there is always a save point immediately before boss encounters. There are several unique themes, offering some visual variety and few area-specific hazards. While most areas are comprised of various arrangements of metal, there are some organic areas as well, and some paths that are accessible via teleporters or smashing through destructible blocks. The four bosses represent the game’s toughest challenges and they offer the most complex behaviors. 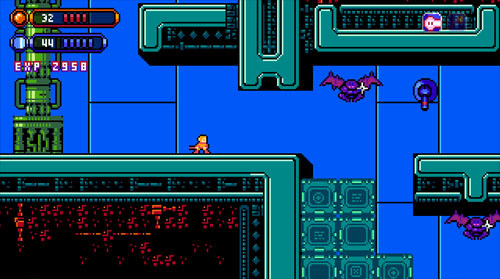 They can be tackled in any order, although the tougher bosses are farther from the starting point and are located in areas with tougher enemies, meaning players are less likely to encounter them early on. In addition, the array of available upgrades – and the fact that they can be acquired at any time – means that almost any battle can be won through attrition. 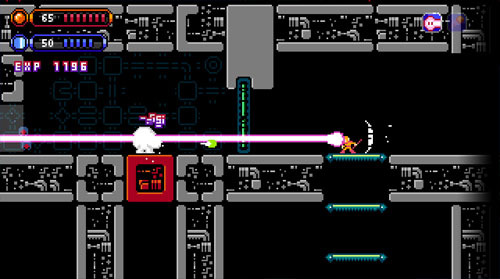 Bosses include a dual saber-wielding bot with a canine companion that can dash along the ground. At any point during this fight, the floor may be destroyed, bringing the fight down to a lower level, but lots of MP pickups in the lower area let the player make heavy use of spells during this battle. There’s also a bot with an electric guitar that sends out sound waves, one that carries an umbrella that it uses as a shield, and one with an Air Man-esque fan in its chest that it uses to push you back. 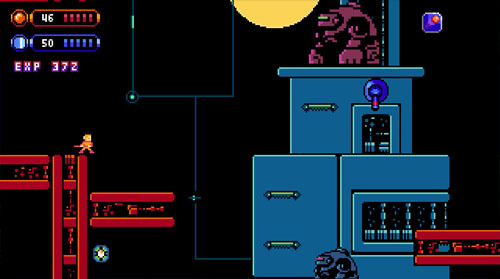 Defeating a boss leads to a victory screen showing an unlocked ability and time to defeat the boss, and a short ending cinematic plays when the final boss is defeated. The final summary screen shows your total completion time, map completion percentage, and number of seconds taken to defeat each of the four bosses. The game can be completed on a first attempt in under two hours, so skilled players may complete it in a single sitting. 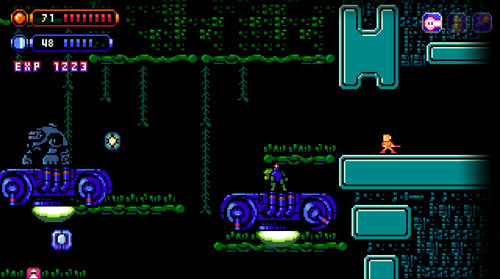 Aesthetically, the game features 4-color sprites and simple color schemes, with unique themes for each of the geographical areas and mostly solid black backgrounds, alongside a haunting soundtrack. Sun Wukong vs Robot (a.k.a. 孙悟空大战机器金刚) was developed by Bitca Games, based in Nanning, Guangxi, China. The game was developed by Yonghai Yu, with additional art by Qi Pan, and music by Alexandr Zhelanov, Michael Robinson, and Zander Noriega. 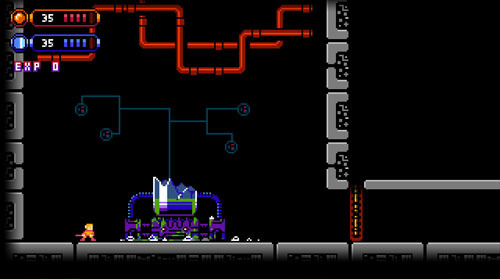 The game was developed using Construct 3.